In the original painting — at least in the online versions I’ve been able to find — the palette is very limited but is dominated by a strong yellow that is moving towards green. I’m not sure how much of this is due to old varnish, fugitive pigments, or perhaps a green underpainting showing through thin glazes of skin colours (glazes that have become increasingly transparent over time). My finished version will be much warmer by comparison. Below is my copy, in its current state (Feb 1, 2019) placed next to the original. I began with a charcoal drawing on my panel. In preparation, I used Photoshop to create a reference photo that would have the same ratio as my 20″ x 16″ panel; I overlaid a grid on this image and created a similar grid in charcoal on my panel prior to drawing the figure. The grid helps ensure I have the key landmarks of the figure placed correctly. Next, I created a an opaque greyscale underpainting (called a grisaille) to map out the values I want and to give the forms a pleasing solidity before I start applying colour on top. I premixed all of the skin tones I would need before starting to apply colour. For fellow practitioners of the Munsell Colorspace System, I used 2.5 YR and some 5 YR as my primary hues, with ranges of values 2-6 and chromas 2 to 8). After every thirty minutes of work, I take a photo on my iPhone to record my process. I also tried an experiment with time lapse video on my iPhone. I’ve put them altogether in the short video below. In this scene from ancient Greek mythology, the god Vulcan is resting from his labours as a blacksmith. Venus, his wife and the goddess of love, has begged him to forge weapons to protect her illegitimate son, Aeneas of Troy, whose descendants would later found Rome. Vulcan looks like he’s having second thoughts. (It’s complicated; read Virgil’s Aeneid). 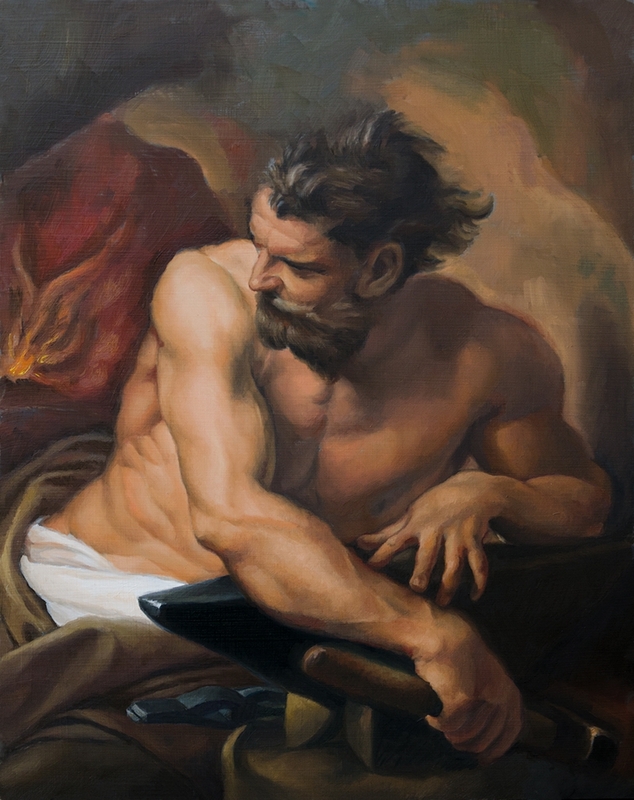 The body may look heroic (at least in its references to classical antiquity), but the twist in the pose and the flowing hair makes him seem more like real living flesh than marble. I am also very impressed by the composition. If you draw diagonal lines from the corners and the mid-points (an exercise called finding the armature of a rectangle), you’ll see how things line up nicely. The main angles of the model’s pose align with those diagonals. Notice too where the diagonals intersect, especially at the elbow. Even the position of the forehead and the height of the left hand follow a two/fifths design pattern (where the space is divided into fifths and the key lines are at 2/5). I can only imagine the number of preparatory drawings required — not to mention that of the artist and model –to create this composition!